I have some particular blogs that I almost read everyday and Ebony intuition is one of them . 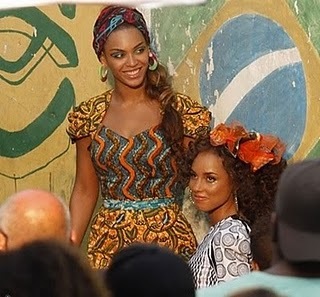 I found these beautiful pics of Alicia Keys and Beyonce in boxing kitten . This is for the video shoot of their new song . I Love boxing kitten and a presented her work on ciaafrique before. There was some controversies surrounding the fact that she does not even mention the origin of the fabrics she uses. I think she does some beautiful pieces with the fabrics but at the same time I think these stars should use African designers as well. There are so many good ones out there. Maybe this will inspire people to an put some highlights on our Designers. What do you think ?